Richard Band College of William & Mary Dean of Faculty and Chief Academic Officer, Dr. Vern L. Lindquist, has been selected to participate in The Association of Chief Academic Officers (ACAO) Digital Fellows Program. Dr. Lindquist is one of 32 provosts and chief academic officers (CAOs) chosen nationwide for the prestigious program supported by a grant from the Bill & Melinda Gates Foundation. Softball player Kay’lee Justice was recently featured in her hometown newspaper. The rising sophomore player talks about her successful first year on the field and in the classroom at Richard Bland College of William & Mary. Thirteen students from Richard Bland College of William & Mary were recently inducted into the Phi Theta Kappa International Honor Society for academic achievement, joining 35 RBC students in the organization. Students from Richard Bland College of William & Mary and Virginia State University recently partnered on a service learning trip to Hobcaw Barony, South Carolina. 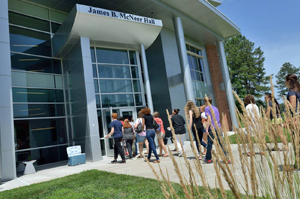 High performing high school students who will be upcoming freshmen at Richard Bland College of William & Mary are now eligible for a new financial assistance program that could save them up to 80% on tuition. Richard Bland College of William & Mary and Navitas today announced the launch of a partnership to support the College’s internationalization goals.